Hope Sewing is Genetic: Congratulations are in order! Well that latest blog hop definitely set a record here for my little corner of the interwebs. 192 comments means 192 entries on my Pezzy Prints giveaway! Probably twice as many as I've received ever. The consensus really seemed to be that these charms would be great for placemats and table runners and pillows, or also the children's quilt that I tried to make that just didn't work out for my poor little brain. I'm also a handful of folks over 100 followers now, so I'm really hopeful that I can continue being entertaining. Now, what you all want to know - who won! #38 was Cindy, who blogs at Quilt Doodle Designs! I will be e-mailing Cindy shortly and will choose a back-up winner if I don't hear from her by Monday. Cindy said she'd make a table runner and placemats, and hopefully she'll share them on her blog if she does! Thank you again to everyone who has entered. Have a fantastic weekend! 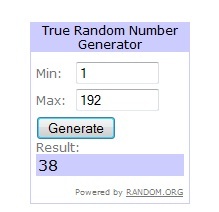 Congrats to Cindy and thanks for the fun giveaway! Parabéns a vencedora e obrigada querida amiga Steph.Beijos. Thank you so much! I can't wait to work with my new Pezzy prints!